You want to grab and keep the attention of your consumers through digital signs. Our multimedia software tools allow you to promote your product or service by incorporating a multitude of media files, graphics, animations and images. But to pull together an award winning multimedia presentation that will stun your targeted audience you need your digital signage display broken down into the categories of text, images and video. Digital Signage Solutions will design your multimedia playlist which gives you the power to decide “what, when and for how long’ each content category will play and where. Multimedia gives you maximum flexibility over content, and allows you to target your audience in the most effective way. 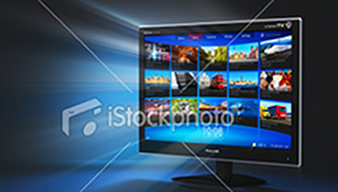 Our user friendly web interface means you can quickly create your unique multimedia presentation while at the same time allowing you to manage what is playing and where. You’ll also be able to take a number of images or a PowerPoint presentation and transform them into a video clip. Get in touch today to find out more about our multimedia software.